Mesh Oval Pencil Cup offers divided compartments for easy organization of different writing utensils. 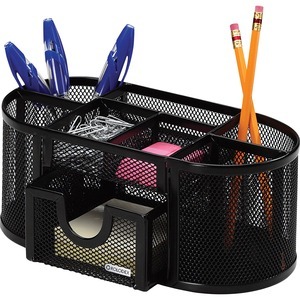 Additional compartments easily accommodate paper clips and small accessories. Drawer adds more storage for 3" x 3" notepads or other small items. Pencil cup is made of rolled mesh steel in a criss-cross design.